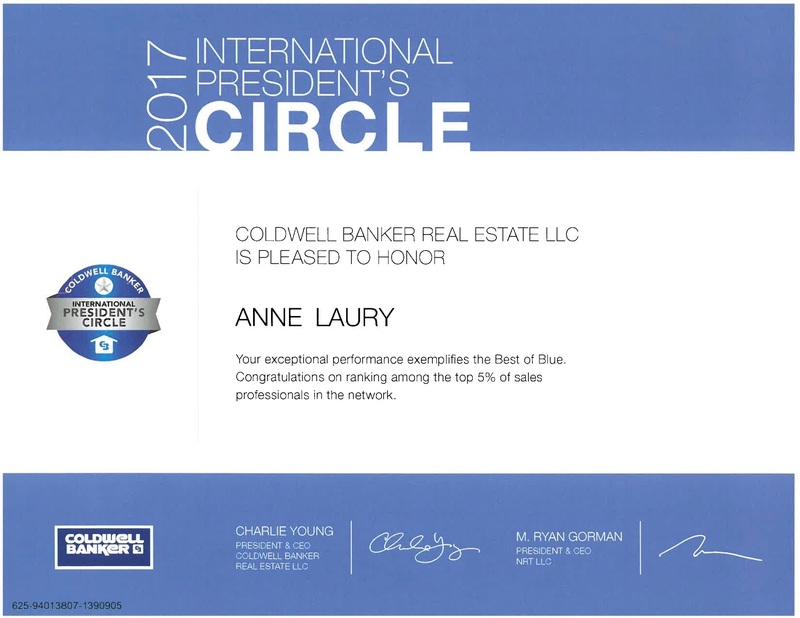 In recognition of Anne Laury's exceptional 2017 performance, Charlie Young and Ryan Gorman of Coldwell Banker and NRT honored her with the Coldwell Banker International President's Circle award. Anne Laury now ranks among the top five percent of sales professionals in the worldwide network. Achievement at this level requires extensive market knowledge, industry experience, dedication to clients and outstanding customer service. In her first full year in real estate, Anne won the Rookie of the Year Award. Her second year earned her ranking in the top ten percent of real estate agents in the company. Her professionalism, expertise, initiative, and commitment make for a winning combination for her clients. Today, Anne works with nationally recognized luxury real estate expert Joel Goodrich in his San Francisco practice. Anne brings a unique background to her work, having earned a business degree from the prestigious INSEEC Business School in France and working for years in sales in the high-tech industry. Her business expertise and a keen eye for great real estate deals – coupled with Goodrich’s experience in the Bay Area’s luxury markets ­– make Anne a top choice for anyone looking to buy or sell properties in fast-paced, dynamic San Francisco. A native of the Alsace wine country in France, Anne moved to San Francisco 25 years ago to start her career in Silicon Valley. She successfully led sales for five companies – Cygnus, Ipro, LivePicture, LuckySurf.com and Geary LSF – until taking a break to raise her young children. While in the tech world, she worked on every aspect of small to large transactions, on both the buyer and seller sides. Today, she uses her high energy and her salesmanship skills to get the best possible deals for her clients. Anne has a special expertise in working with home buyers in Europe and Bay Area, helping international clients buy and sell real estate locally and overseas for the best price. She also has experience with short sales, investment properties, second homes, and vacation homes. Her business and technology background enables her to provide unique insight to her clients, especially for the investment/financial aspects of their transactions. Anne is pleased to serve as your dedicated resource for real estate news, sales, transactions and insights on the Bay Area market. She is also a valuable resource to help you find the best areas to live in according to your situation and can provide detailed information about communities, schools, and local businesses, as well as staging companies, photographers, inspectors, gardeners, contractors, cleaning staff, and more. Five words define Anne: energetic, honest, dedicated, passionate and fun. When she is not researching deals for her clients, she can be found windsurfing on the bay, playing tennis, or skiing on the slopes of Squaw Valley.